The solid Tigers girls’ volleyball team shares a common vision – and at least one name. SOUTH PASADENA.–At one point in the third game of South Pasadena High’s match against visiting La Cañada on Oct. 9, one of the home team’s players spotted a slime of some sort on the floor, just under the net. “Eeeww, gross!” she bellowed, drawing all attention away from the game. 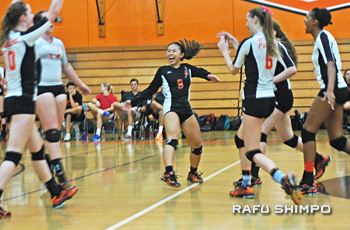 “Yeah, that was sweat, and it was mine,” confessed South Pas sophomore libero Madison Hirano. But she wasn’t apologetic, not in the least. “Sweat means you’re working hard, and that’s what it takes to win,” she insisted. The statement may be the perfect encapsulation of the attitude carried onto the court by Hirano (no relation to the writer of this story) and her entire team. The 15-year-old shares something else with a Tiger teammate as well – a name. Far more remarkable than the name coincidence is the fact that Saito has made the Varsity team as a frosh and Hirano is starting as a sophomore. South Pas head coach Ben Diaz said he has plenty of underclass players, but the squad is solid as a whole. “She’s little, but she’s fast and she covers a lot of ground,” South Pas head coach Ben Diaz said of the 5-foot-1 Hirano. The Tigers posted a three games to one win over sixth-ranked La Cañada, after winning the Rio Hondo League championship last season and breaking a string of 10 straight titles for La Cañada. It was South Pas’ first league crown since 1982. After last Tuesday’s win at Blair, the Tigers improved to 8-5, and are a perfect 4-0 in league. They look to extend their conference play winning streak to 17 when they take on Temple City Thursday afternoon. With the likes of senior hitter Sophia Hathaway and blocker Shanovi Bass up front, South Pas’ current success in league may be interpreted as a statement, that the young, disciplined Tigers are going to be a force in the Rio Hondo for years to come. 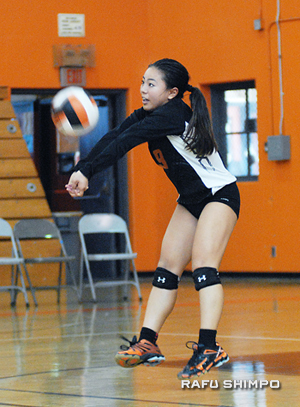 At libero, the 5-foot-1 Hirano has become an integral part of the Tigers’ game plan. Diaz said her confidence has improved greatly over the course of a year. “I expect a lot from her, and she expects a lot from herself as well,” he said. Both Hirano and Saito are relatively new to volleyball, having first tried their hands at the sport around the sixth grade. “I was interested after playing at a volleyball club, and I just fell in love with the sport,” recalled Saito, who, for good measure, has also earned a spot on South Pas’ girls’ Varsity basketball team. She’s currently sidelined with a minor back strain, possibly suffered during basketball. The girls have both honed their skills by flinging themselves into the sink-or-swim arena of travel club ball. 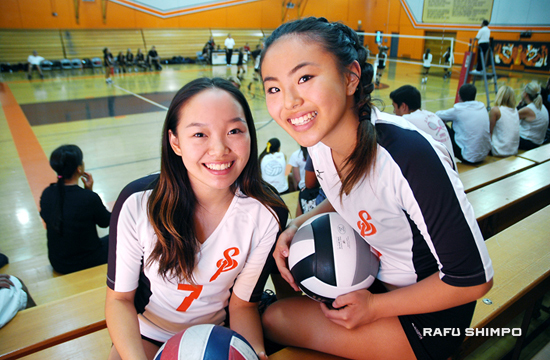 They are on separate teams within the San Gabriel Elite Volleyball Club, an organization renowned for its successful – and intense – development of young players. Hirano got an additional – if rather expected – vote of confidence from her mother, Aya, herself a former standout on the court. With Hirano at libero and Saito (not pictured) learning the outside hitter position, the Tigers are looking to repeat as Rio Hondo champions. At nationals, Hirano’s team finished as the ninth-best in the nation, while Saito’s club ended in 17th place. Academically, both girls are equally solid off the court, posting straight A’s in their classes. They grumble a bit about strict teachers and homework, not to mention the time management struggles. “It’s hard when you have practice after school every day, then you have to rush home and do your homework, and still find time to eat and have friends,” Saito said. Diaz said Saito’s skills and her understanding of the game make her a valuable addition to the Varsity team. “She’s starting to catch on to what we like in the program. Having the others around helps her grow up faster. We have a good team, so that’s going to make her better,” he explained. For her part, Saito is enjoying the camaraderie as much as the sport. Hirano, who earned an All-Rio Hondo League honorable mention for 2013, has begun to consider college choices, although she’s unsure if volleyball will be a major part of it. She’s eyeing her father’s alma mater, UC Berkeley, as well as Claremont and UCLA. The immediate focus is on the Tigers’ next five matches, all league contests, including a rematch with La Cañada. Chris Saito sees plenty of good news to come from one or more players by the name of Madison.